The summer blew by in a blink with all the travel we got up to. We only went kayaking once! What a serious shame. 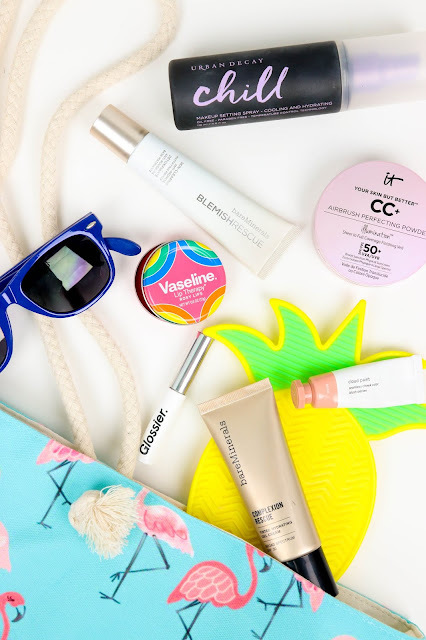 I did find some time to shake my my makeup routine and a few products stood out as summer favorites I'm sure I'll be using even as sweater weather hits. I'm still in a real Glossier moment with my two favorite products being their Boy Brow in Brown and their Cloud Paints. I've been wearing Dusk all summer long and have to actively try to wear other blushes just to mix things up. It's a gorgeous coral-pink that gives a nice flush to the skin without being too overly blushy. It's also the most buildable blush I've ever used. Boy Brow is a brow gel that I use as a brow filler. Lazy me loves swiping this on my brows and calling it good. Plus it darkens up my pretty light brows so you can actually SEE them. Occasionally I force myself to step away from the Stila One Step Correct and try another primer. I've been giving the new bareMinerals Blemish Rescue Primer a go and although it's not going to replace One Step Correct, it's definitely a great alternative. It's hydrating, smooth on the skin without feeling silicone-y, and leaves a nice base to put makeup on top of. If you're in the market, check this one out. With it being so hot here lately I've taken to actually using powder to keep the shiny away. I'm always a fan of dewy, but greasy and sweaty is just too far. The It Cosmetics Airbrush Perfecting Powder helps to set everything in place without looking cakey or too matte. It also helps to make sure nothing slides off my face during the day. It also has SPF 50 which is bananas. All good things, right? I've also been using a setting spray like nobody's business. Urban Decay's All Nighter is my usual go to, but I've been using Chill and honestly can't tell the difference between the two. They take some time to settle onto the skin, but my makeup lasts so much longer when I use a spray over when I don't. Dry lips are basically my MO all year round, but I wanted to mix things up from using my usual plain vaseline to something a bit more festive. I know...look out...Kayla is over here really shaking things up. Vaseline Rosy Lips has everything I love about vaseline, but with a bit of color thrown in. Wild child is my middle name. Summer has been so hectic over here that I must admit I'm pretty excited to wave the humid weather goodbye and throw a cozy sweater on. Remind me of this when it's the dead of winter, k?